The world number three said it is a condition she will have to deal with daily. The Dane was beaten by Elina Svitolina today. WORLD NUMBER THREE Caroline Wozniacki revealed on Thursday that she has been diagnosed with rheumatoid arthritis, a revelation she found out before the US Open. The 28-year-old said she would look at ways during the off-season to control the autoimmune disease. “You find a plan, figure out what to do, you do your research, and thankfully there is great things now that you can do to it,” she said. “The medication has really improved, so that’s amazing,” she said. “You have to think about diet, sleep, everything else. Email “'It's a lifetime thing': Wozniacki reveals rheumatoid arthritis diagnosis”. 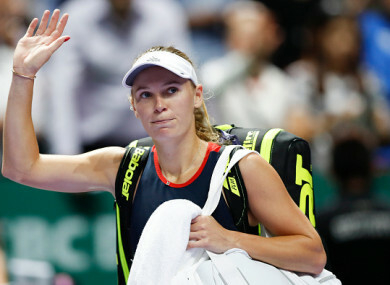 Feedback on “'It's a lifetime thing': Wozniacki reveals rheumatoid arthritis diagnosis”.